The Cluster panel can be used to establish settings for the cluster. Only Full Administrators and Cluster Administrators can configure cluster settings. 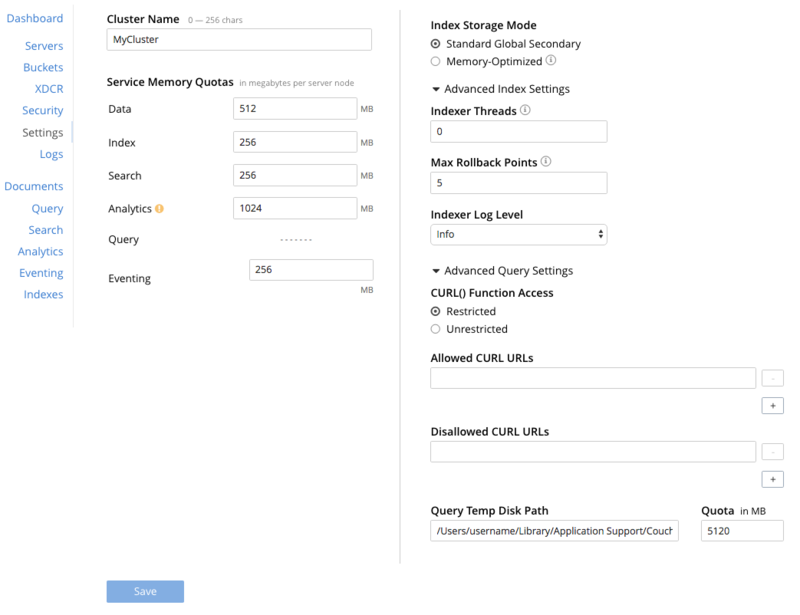 Use the Settings > Cluster tab to configure the cluster name, memory quotas, and index settings. You can define the settings using Couchbase Web Console, the CLI, or the REST API. Select the Couchbase Web Console > Settings menu. By default, the Cluster page is displayed. The name that was given during the initial setup. You can change it at any time. The per-node memory that is available to Couchbase services limited to the smallest node in the cluster. These values can be adjusted in the UI, with the CLI or with the REST API. The per node memory allocation for the key-value cache used by the data service. At a minimum, it cannot be made smaller than the sum per node bucket quota of all buckets combined. This setting controls the buffer cache size of the index storage layer. The specified memory is pre-allocated as soon as the indexer starts up, and is shared with all indexes created on the node. The total memory usage of the indexer process will be the buffer cache plus the size of various internal data structures and queues. This setting controls the RAM quota for Full Text search. It shows the amount of the main memory allocation for Full Text service per node. This setting controls the RAM quota for Analytics. It shows the amount of the main memory allocation for the Analytics service per node. This setting controls the RAM quota for Events. It shows the amount of the main memory allocation for the Events service per node. Specify either Unrestricted or Restricted, to determine which URLs are permitted to be accessed by the curl function. If Unrestricted (the default) is specified, all URLs can be accessed. If Restricted is specified, the UI expands, to display configurable fields into which the URLs allowed and disallowed can be entered. Define the Index Storage Mode as Standard Global Secondary or Memory-Optimized, then click the Advanced Index Settings pull-down menu. The number of dedicated threads used by the Index Service. The number can be increased on multi-core machines to increase the amount of CPU available to the Indexer. The default is set to 0. The maximum number of the committed rollback points. The default is set to 5. Adjust the logging level from least to most verbose, the options are: Silent, Fatal, Error, Warn, Info, Verbose, Timing, Debug, and Trace. The default is set to Info. It is advised to leave this setting as the default unless Couchbase Support directs you to change it. The path to which temporary files are written, based on query activities. Specify a maximum size in megabytes.